Town union governments are powerful agents of development through promoting peace, economic and environmental protection activities at the village community level in Eastern Nigeria. Igbo communities organize town unions as indigenous self-help community development associations without government influence as a platform for implementing development projects in their towns/villages. Recently Igbo State governments have begun recognizing town unions as an important tier of their governments along with the Council of Chiefs. 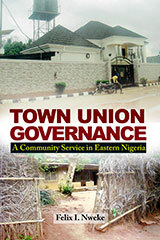 This book is a documentary of the author’s experience as head of a town union government in Eastern Nigeria. The book highlights the desperate plight of the poor in societies that are in transition from rural to urban communities and draws attention to the increasing demands on town union governments as agents of change in such societies. The book cautions that government’s interference in the administration of town unions will compromise their foundational element, namely as self-help institutions. Felix Nweke served as the President General of Ukpo Dunukofia town union from 2006 to 2008. He has been a professor of Agricultural Economics at the University of Nigeria, Nsukka; senior economist at the International Institute of Tropical Agriculture, Ibadan; visiting professor at Michigan State University, East Lansing among other positions. In 2012, he received a lifetime achievement award for leadership in root crops research. His previous books include The Cassava Transformation: Africa’s Best Kept Secret (2002) and Yam in West Africa: Food, Money and More (2016).